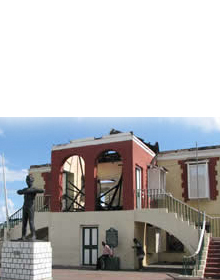 Built in 1795, the Falmouth Parish Church (also known as St. Peter’s Anglican) is the oldest public building in the town. The land for the church was donated by Edward Barrett, part of whose estate had been bought to lay out the town. 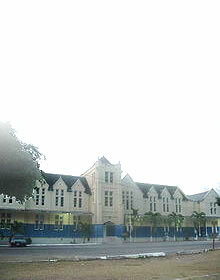 Constructed in brick and stone, the Church is a good example of vernacular architecture derived from classical forms. 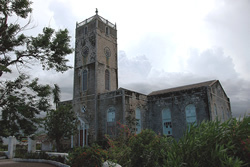 After an 1842 extension, St. Peter’s stands as one of the largest Anglican churches in the island. There are two galleries in the Church one to the north and the other to the west. Four massive and monumental timber columns support the roof. The monuments on the interior walls of the Church date from the early nineteenth century. 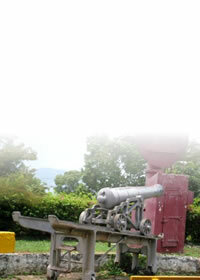 The church organ was donated by John Tharpe Esq., the original owner of Good Hope Estate in the parish of Trelawny. Graves spanning over two hundred years can be found in the churchyard.